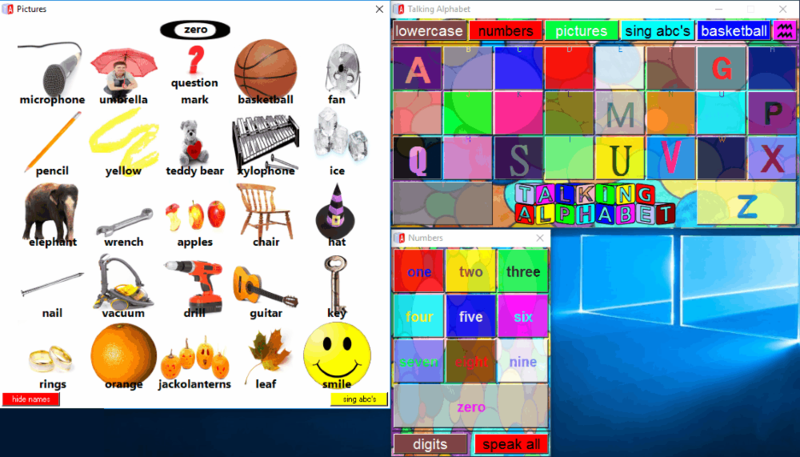 Here is the list of best free Alphabet Games For Kids For Windows. These alphabet games are suitable for both toddlers and preschoolers. These games come with interesting English exercises that make learning fun. Kids will enjoy playing these educational games. Some of these games represent the English alphabets as funny animated characters. Kids will love playing these games as they all come with funny music and animated cartoon characters. Kids can hear and sing alphabet songs along with the computer. This makes them learn all English alphabets quickly. One of these freeware comes with an interesting feature, a bouncing basketball. A single click on the basketball makes it bounce on the whole screen. This feature is added just for fun, so that kids will not get bored. GCompris: As per my opinion, this is the best educational game for kids. This software is available in both free and paid versions. The best part of this game is that its free version also has a good collection of games that kids can play. It is a complete educational software which helps your kids grasp the concepts of different fields of study like Science, English, Mathematics, etc. I liked the way they have presented each game. The sweet music and awesome animation has made this game more interesting for kids. This is a complete educational package for toddlers and preschoolers. That’s why, I strongly recommend this free educational game for your kids. Kids Preschool Learn Letters: This is a free alphabet learning app for kids available at the Microsoft Store. It is my second choice for kids, as it comes with the features that make it most suitable for kids. Each English alphabet in the app is shown as a funny animated character, which is the main source of attraction for kids. In addition, different categories of games are added to the app, so that kids can learn alphabets by practicing again and again. 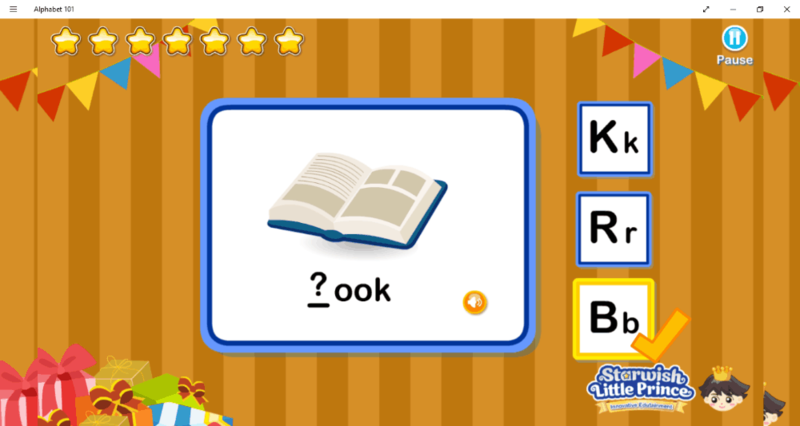 You can judge your kid’s performance in the Quiz Time gaming mode of this free alphabet learning app. Go through the list and install the games on your system that you consider the best for your kids. You may also like these Best Free Math Games for Kids, Best Free Typing Games For Kids, and Best Free Paint Software for Kids. 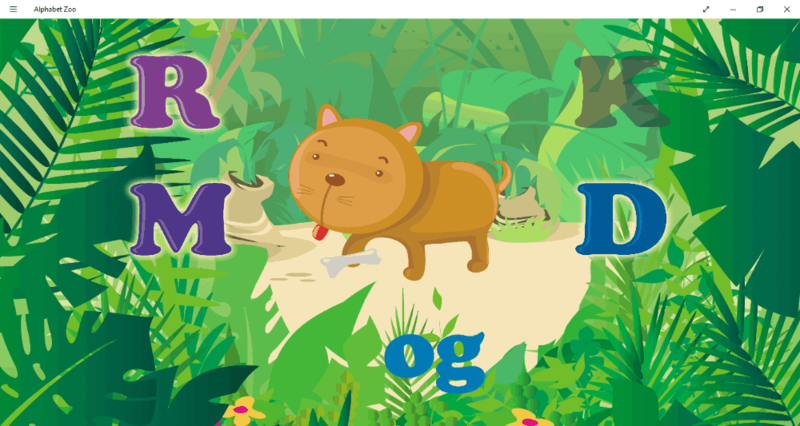 GCompris is one of the best alphabet learning game for kids for Windows. This game comes with a lot of features that make it suitable for preschool kids as well as for toddlers. This interesting game not only teaches ABC to kids, but also enhances their vocabulary. I strongly recommend this game for kids, as it comes with different categories of games like math games, science games, puzzle games, color games, and a lot more. As this article is all about learning alphabet games for kids, so here I will explain only about the ABC game of this freeware. This education software is available in two versions, free and paid. Paid version provides complete access to all the games, but its free version also has a lot of educational games to play. Kids can learn drawing each alphabet correctly. By playing this game, they can learn all English alphabets and differentiate between lower and upper case letters easily. A lot of interesting gaming activities will definitely boost your kid’s vocabulary. GCompris is a complete educational package for kids that will boost your kids thinking ability and make them intelligent in the different field of studies like Mathematics, English, Science, etc. That’s why it is the best educational software for kids in this list. 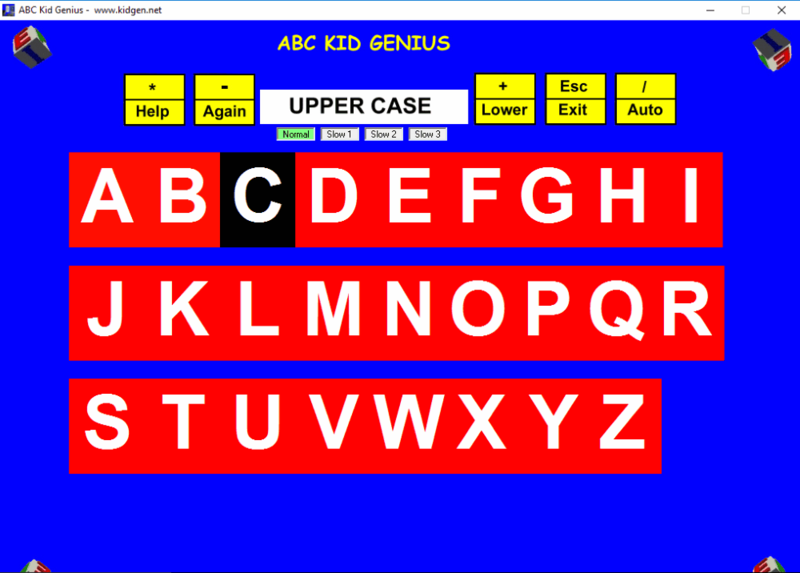 ABC Kid Genius is one of the best free Alphabet Games for kids for Windows. This game will be a good choice for you kids to teach them alphabets. It also teaches them counting from 1 to 9. This freeware comes with three different categories of games, namely: Abc123, Words, and Spelling. ABC123 mode of the game helps your kids learn and pronounce all English alphabets correctly. This mode of the game is further categorized into 6 sub-categories, which include Random Letters, Alphabets, Play Alphabet, Sing Alphabet, Numbers, and Counting. In Random Letters mode of the game, kids have to enter any letter by pressing an alphabetical key on a keyboard and computer pronounces that letter. 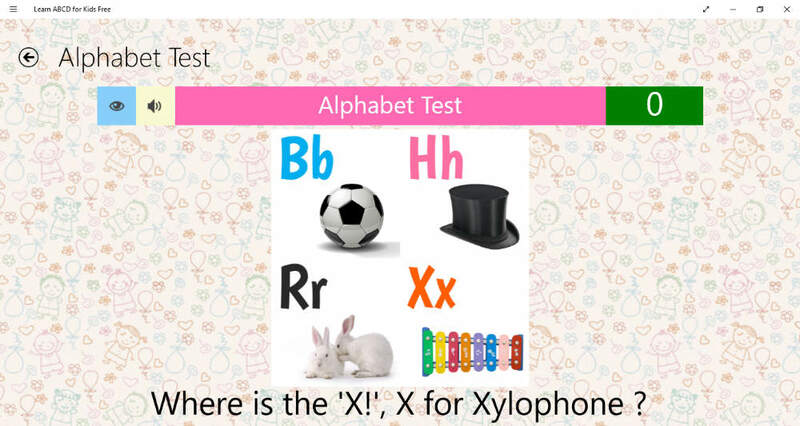 Play Alphabet and Sing Alphabet are the most interesting games in the software as per my opinion. Play Alphabet mode of the game is very similar to that of Playing a Piano. Your kids will love this mode of the game. Words and Spelling games enhance your kid’s vocabulary. They have to type the correct spelling of an object displayed on the screen. As kids type the correct word, the computer plays a video related to that image, so that kids can learn by linking and visualizing that word. These playing modes contain only a few words but you can add 992 more words and videos to the game to teach your kids. Adding new words and related videos is easy and free. Simply go to the Create menu, then choose and add words from the database. This is the best feature of the game that I liked while testing it. This fun game helps to build the vocabulary of your kids and they will memorize all English alphabets quickly. Talking Alphabet lets your kids learn English alphabets with fun. The software shows all alphabets from A to Z in both Upper Case and Lower Case. Click on any of the alphabets and this game will pronounce that alphabet. This will help them recognizing all the alphabets. Besides this, kids can also learn to count from 0 to 9 along with their spellings. Kids easily get bored of learning, that’s why, a Basketball game mode is provided in this alphabet learning freeware. Clicking on the basketball will make it bounce on the computer’s screen. 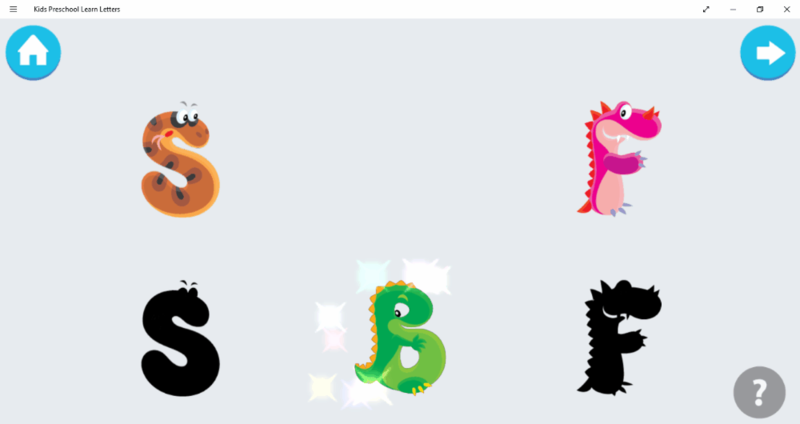 MyABCs is another free alphabet learning game for kids. The software is specially developed for toddlers, so that they can learn all the English alphabets with their correct order. This game is very easy to play. Kids have to press a key on the keyboard according to the alphabet displayed on the screen and the computer pronounces that letter. Along with an alphabet, an object whose name starts with that alphabet is displayed. In order to hear the name of the object, press the Spacebar key. Alphabetic Adventures is an adventure game for kids. This game is all about a little-animated character named Ginzi. A phantom has kidnapped his girlfriend and now, he has to rescue her. Playing method of the game is simple. Kids have to press the alphabetical key shown on the screen in order to tackle all the dangers on the way. Requires less space on your system. Cute animated characters with funny sound effects. Helps kids to learn alphabets easily. Good for typing practices too. This game can’t be played on full screen. That is the only disadvantage of the game. If you are looking for an alphabet learning game for kids that contains a lot of English exercises, try Kids Preschool Learn Letters. Your kids will not get bored easily of this game. Amazing graphics along with cute cartoon characters and good sound effects make this game interesting for little kids. Different gaming categories are added to the app in order to make learning fun. Some of these games are Shadow Matching, Color Ball, Bubbly Alphabets, Jigsaw Alphabets, Dot to Dot, Odd One Out, etc. Shadow Matching: In this playing mode, kids have to place each alphabet to its respective position. Bubbly Alphabets: In this game, kids have to pop that balloon which contains the letter pronounced by the computer. Odd One Out: A list of alphabets is shown on the computer’s screen. Kids have to select the alphabet that does not belong to the group. Letter Hop: Help frog to reach the pond by clicking on the letters in correct sequence. Dot to Dot: Kids have to match all the dots displayed on the screen in correct alphabetical order. You can judge your kid’s performance in Quiz Time gaming mode. Let your kids learn English alphabets with fun by playing Alphabet 101, a free alphabet learning game. The interface of this game is designed in such a way that kids will find this game interesting. 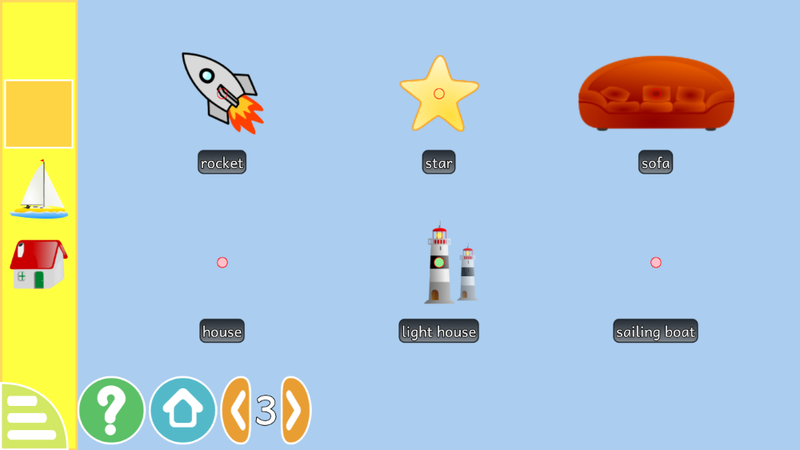 This free alphabet learning game for kids help building their vocabulary. This game is very easy to play. It comes with two types of playing modes, namely, Flash Card and Play Game. 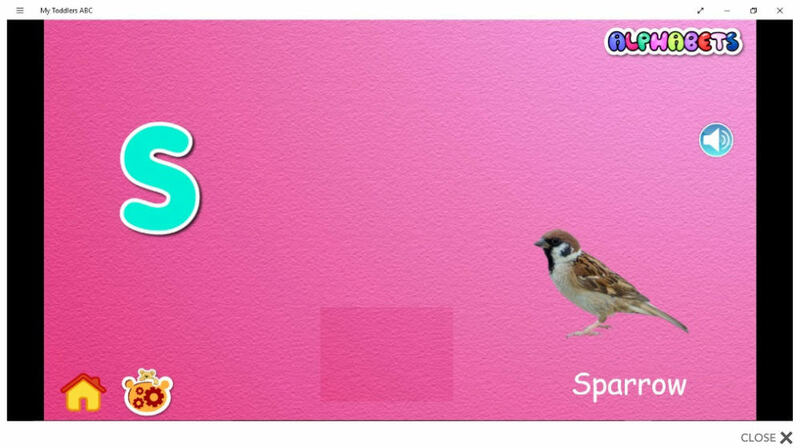 Flash Card mode of the game contains flash cards labeled from A to Z alphabets. Each alphabetical card shows a lower case letter, an upper case letter, a picture, and the name of the picture. As kids click on a card, the computer pronounces the letter and the name of the picture. This will help your kids remembering English alphabets quickly. You can take a test of your kids in Play Game mode of the game. A picture is displayed on the screen along with three options. Kids have to select that option which fits correctly to the picture. They will be rewarded with one star for every correct answer. Install this free app on your computer and make alphabet learning fun for your kids. My Toddlers ABC is another app for kids that will teach them English Alphabets with fun and in an enjoyable way. The best part of the game that I liked is that it presents each English alphabet along with a picture and each alphabet contains more than one pictures. This will help kids learn different words starting with same alphabets. Moreover, there is a speaker button, clicking on which, kids will hear the sound of that particular picture that is displayed on the screen. Sing with me is another mode of this game. In this mode of the game, computer sings a sweet ABCD song. Let your kids sing this sweet song with the computer, so that they can learn English alphabets quickly. All in all, this is one of the best alphabet learning games for toddlers that is developed to make learning fun for kids. 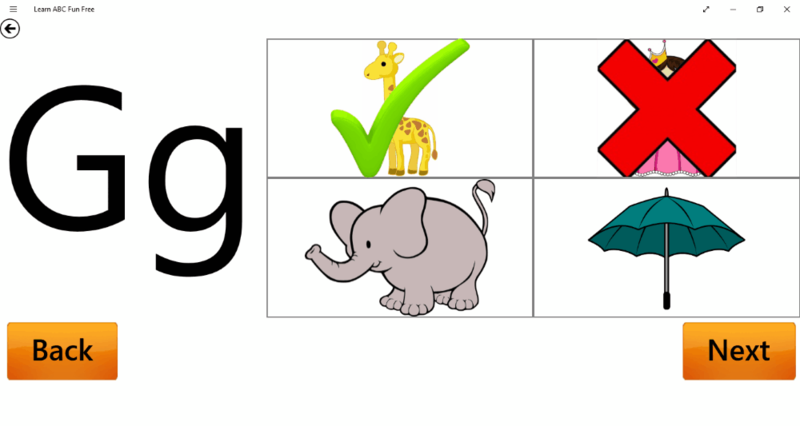 With the pictures of animals found in the Zoo, this wonderful alphabet learning Windows app helps your kids learn ABC without any difficulty. All Zoo animal pictures added in the app are animated, which makes this app friendly to little kids. Kids will not find any difficulty in playing this game. The app displays every animated picture on the screen along with four options and just below the picture is the name of that animal with first letter missing. Kids have to choose correct alphabet in order to complete the name of that animal whose picture is displayed on the screen. As simple as that. Learn ABC Fun is a totally free ABC learning app developed for kids. The app displays all English alphabets with animated images, which is the main source of attraction for kids. It is a good way for boosting the memory of kids. Playing method of this game is simple. Every time you switch to the next or previous letter, you will hear the name of that alphabet. Play ABC and Learn ABC gaming modes are provided here only for learning purpose. You can also take tests of your kids in the quiz mode of the app. Kids have to answer correctly to the question asked by the computer just by clicking the correct letter or image. That’s all. 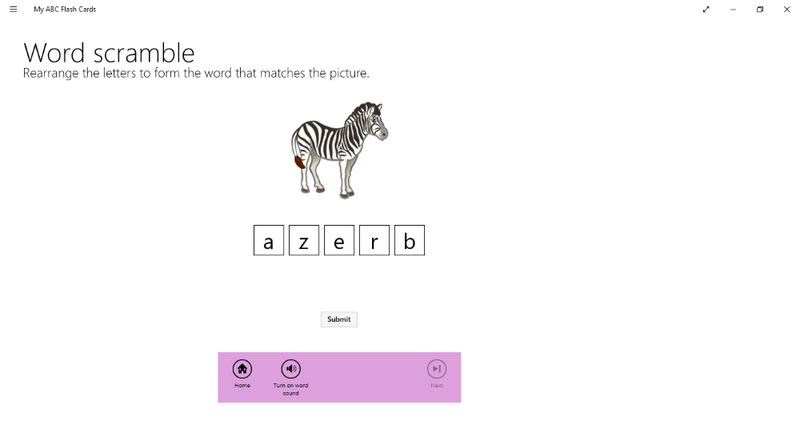 My ABC Flash Cards is a very good alphabet learning Windows app. 5 different types of quizzes in the game will be the best brain exercises for your kids. Kids can check their knowledge by participating in these quizzes after learning all the alphabets. Add the first letter, Add the last letter, Add the missing letter, Match the picture, and Word Scramble are the 5 different types of quizzes that are available in the app for practice. All quizzes are based on the same principle. A picture is displayed on the screen and kids have to answer that picture correctly either by typing, matching, or arranging the letters in correct sequence. This free ABC learning app not only teaches ABC to your kids, but also improves their learning power with the help of different brain exercises. Learn ABCD for Kids is another free alphabet learning game for preschoolers that lets your kids learn ABC without any difficulty. This app not only teaches alphabets to your kids, but also helps them learn shapes, numbers, and colors. The app comes with four types of games, namely: alphabets, shapes, numbers, and colors. Except Alphabets, all other games are paid. Learn ABCD for Kids displays each alphabet in both Upper and Lower cases along with their respective image. In addition to this, the computer pronounces each letter, so that kids can learn all the alphabets by relating them to their respective images shown on the screen. You can also take a test of your kids in the app. Kids have to select the correct answer to the question asked by the computer.